Drug Labels supplement the printed information included with prescription drugs and over-the-counter medications. Medical professionals use drug labels to communicate information to ensure proper patient care. Anesthesia Drug Labels help prevent confusion and misidentification. For example, printed medication names eliminate errors resulting from illegible handwriting. And, for prepared medications they allow the medical staff to record key data points, such as drug name, strength and more, to aid in proper dispensing. Anesthesia drug labels assist medical professional in labeling medications properly. 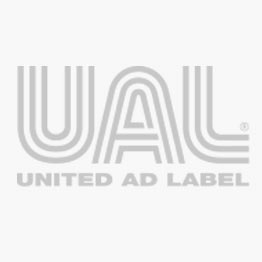 United Ad Label provides anesthesia drug labels that conform to the nationally recognized color coding ASTM standard D-4774-93 and help meet the Joint Commission NPSG 03.04.01. Our tallman lettered anesthesia drug labels help minimize the confusion created by look alike, sound alike names. Plus, UAL anesthesia drug labels use flexible paper, making it easy to wrap on small syringes and odd-shaped products. Anesthesia Label, Morphine mg/mL, 1-1/4" x 5/16"
Anesthesia Label, Xylocaine%, 1-1/4" x 5/16"
Anesthesia Label, Brivital Mg/cc, 1-1/4" x 5/16"
Anesthesia Label, Antibiotic, 1-1/4" x 5/16"
Anesthesia Label, Dye, 1-1/4" x 5/16"
Anesthesia Label, Neosynephrine mcg/mL, 1-1/4" x 5/16"
Anesthesia Label, Marcaine mg/cc, 1-1/4" x 5/16"
Anesthesia Label, Heparanized Saline mg/mL, 1-1/2" x 1/2"
Anesthesia Label, Anectine mg/mL, 1-1/4" x 5/16"
Anesthesia Label, Valium mg/mL mg/cc, 1-1/4" x 5/16"
Anesthesia Label, Atropine mg/mL, 1-1/4" x 5/16"
Anesthesia Label, Lidocaine mg/mL, 1-1/4" x 5/16"